During the past dozen years or so, you may have witnessed an explosion in the use of management tools and techniques — everything from Six Sigma to benchmarking. Keeping up with the latest and greatest, as well as deciding which tools to put to work, are key parts of every leader’s job. But picking the winners from the losers is tough. As new tools appear every year, others seem to drop off the radar. Unfortunately, there’s no Consumer Reports for management tools, so choosing and using tools can become a risky and potentially expensive gamble, leaving many leaders stymied. In 1993, Bain & Company, a leading management consulting company, launched a multi-year research project to get the facts about management tools and trends. The objective of the study was to provide managers with information to identify and integrate tools that improve bottom-line results as well as understand their strategic challenges and priorities. Bain assembled a database that now includes nearly 10,000 businesses from more than 70 countries in North America, Europe, Asia, Africa, the Middle East, and Latin America. The Bain & Company’s 2011 Management Tools survey received responses from a broad range of international executives. To qualify for inclusion in the study, a tool had to be relevant to senior management, topical as evidenced by coverage in the business press, and measurable. The results? Out of all the tools included in the survey, 65 percent of respondents used strategic planning. But despite dropping to second place behind the practice of benchmarking, strategic planning is still a long-time favorite tool, having been used by more than half of the companies in every survey since Bain started this project. Not surprisingly, the most popular tools are the ones that create the highest satisfaction ratings. 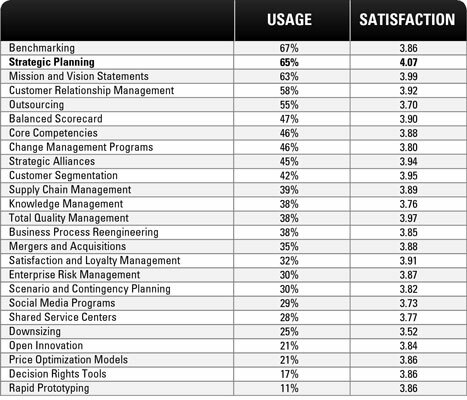 Respondents were most satisfied with strategic planning out of all 25 tools, as shown in the figure. So what does this study tell us? Strategic planning is used by companies worldwide with very high satisfaction rates. Strategic planning is consistently rated the number-one or -two management tool year after year. Management tools are much more effective when they’re part of a major organizational effort and are consistent over time. Managers who switch from tool to tool undermine employees’ confidence. Decision makers achieve better results by championing realistic strategies and viewing tools simply as a means to achieving a strategic goal. No tool is a cure-all. As you can see from the variety of tools listed, not just one is a silver bullet, but rather a combination of the right tools yields the best result. For more information on this study, visit the Bain & Company website.